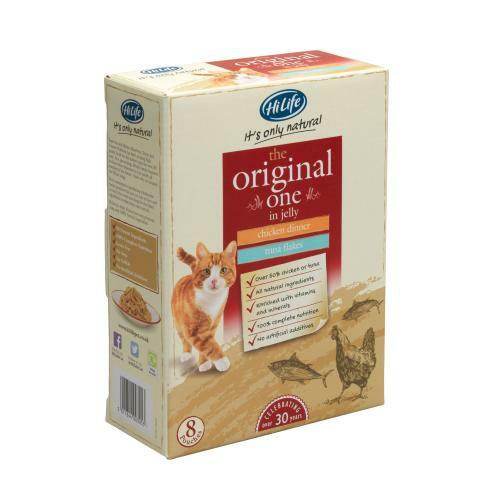 HiLife Its Only Natural Original Selection in Jelly Adult Cat Food is a delicious complete pet food made from succulent cuts of meats & fish in a tasty jelly to provide all the goodness your cat needs. Hi Life steer clear of using any nasty artificial additives in their cat food formulas, making it easy for you to feed your feline friend with the very best. Contains two scrumptious recipes of Tuna Flakes or Chicken Dinner. Hi Life’s It's Only Natural range is nutritionally balanced, containing all of your cat’s essential vitamins and minerals, as well as lean muscle building protein and fibre for optimal digestive health.